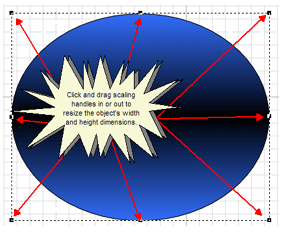 Scaling means resizing, stretching, or shrinking an object to give it new overall height and width dimensions. Any object can be scaled. However, the scaling operation will have different effects depending on the type of object it is being applied to. For example, scaling a text object will not resize the text; rather it will resize the text box and cause the text inside to re-wrap. To avoid pixilation or jagged lines when you are enlarging an object such as an image or vector drawing, be sure the object's anti-aliasing option is enabled. Anti-aliasing is enabled by default for all rendered object types. The easiest way to scale an object is manually in the Work Window using your mouse. With an object selected and either the Page Layout or Object Edit buttons in the Components Bar activated, you can click and drag the object's eight scaling control points in or out to resize the object's height and width dimensions. You will know that you have grabbed a scaling control point when your mouse pointer becomes a double-headed arrow. As you drag, the new pixel dimensions of the object are displayed near the mouse pointer. To maintain the object's aspect ratio, press and hold the CTRL key while dragging a scaling control point with your mouse. You can scale an object selected in the Work Window using your mouse and/or keyboard. You can also resize a selected object in 1-pixel increments by pressing and holding the Shift key while pressing the Up, Down, Right, or Left arrow keys. Similarly, you can resize an object with constrained proportions by pressing and holding the Shift and CTRL keys while pressing a directional arrow key. When the Snap Grid is enabled, an object is scaled when the mouse is used at the current snap grid resolution. For more information, see Snap Grid. If you require precision when scaling objects, you can use the Horizontal and Vertical Scaling controls in the Object Editor or the X and Y Scale controls in the Quick Properties Editor. You can select an object to scale, and then use the controls to adjust horizontal or vertical sizes changes by a factor of 1/100th. For more information, see Object Editor Dialog Box and Quick Properties Editor Dialog Box . Click the Object Edit button: in the Components Bar. By default, unless another tool is selected in the Components Bar, the Page Layout button is active. In the Work Window, select the object that you want to resize. For more information, see Select Object. Click one of the eight scaling control points that appear on the object's bounding box, and drag the control point in or out to resize the object. You can also resize an object in "baby steps" using the directional arrow keys. With an object selected, press the Shift key and the Left, Right, Up, or Down arrow keys to resize the object in 1 pixel increments along either the horizontal or vertical axes. You can scale an object with constrained proportions by pressing and holding the Shift and CTRL keys while the Left, Right, Up, or Down arrow keys. In the Work Window, select the object that you want to resize. The Quick Properties Editor dialog box will open. Enter a proportional resize value in the box. When you are finished, exit the Quick Properties Editor dialog box. The dialog box will close, and the object will be resized to new proportions. The Object Editor dialog box will open. To apply the same scaling factor to both the horizontal and vertical axes, click to select (checkmark) the Maintain Aspect Ratio option box. When you are finished, click OK. The dialog box will close, and the object will be resized to new proportions. In the Work Window, select the object that you want to reverse. Click OK. The dialog box will close, and the selected rendered object will be reversed from left to right in the Work Window. Click OK. The dialog box will close, and the selected rendered object will be flipped from top to bottom in the Work Window.